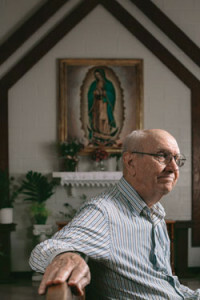 In an article from the latest edition of the Society of Mary (Marists) “e-BULLETIN,” a Marist brother works to help the disadvantaged — and disenfranchised. Notre Dame is operated by the Marist Fathers and Brothers. When Brother Albert Phillipp arrived at his newly formed parish in 1996 with Fr. Michael Seifert, s.m., he found an area in dire need of help. The parish of San Felipe de Jesus consisted of desperately poor people who lived in ramshackle houses, many of which were unsafe. The sun-baked rural community lacked paved streets, garbage collection and streetlights. But this was not a shantytown in some desolate Third World country. This was Cameron Park, a “colonia” just outside the city limits of Brownsville, Texas. Today, Albert is retired and still does volunteer work in the parish. Now he fears, however, that the number of votes cast in the colonia will drop dramatically, starting with the next election, because the Texas stringent voter-ID law has gone into effect. That law, SB 14, restricts in-person voting to those people who can present photo IDs. Adapted from the January 2014 issue of the American Bar Association Journal.